Eliot wasn’t supposed to make it to full term. At thirty weeks into the pregnancy, Matt and Ginny Mooney were told their child had a genetic disease that made his birth unlikely. If their baby lived, it would be for only hours or perhaps a few days. But Eliot was born and lived 99 days. And every one of those days was a gift that would change his family forever. At Eliot’s funeral, 99 balloons were released, one for each day of his life on earth. That simple act of remembrance stirred the community and received national attention. Eliot’s story has been featured on Oprah and the TODAY show, and a video about his life has been seen by millions on YouTube. A Story Unfinished reminds us all that God is ever present and near. My heart is broken but my soul is inspired by this story, and I’m better for reading it. This book will grip you and change you. Eliot’s story reminds us to cherish each day and live life to the fullest. Matt Mooney will take you on a remarkable journey of words through these pages. Expect laughter, tears and to fall in love with a boy named Eliot. With his conversational style and relatable insights, Matt is a guide who will get you to a place of new perspective where you’re more fully alive in every way than when you first began. With wit and honesty and a winsome way with words, Matt Mooney invites readers into the interior of loss—a place where life is cherished, sorrow becomes a companion, questions are allowed to simmer without easy answers, and beauty begins to blossom in the dark. 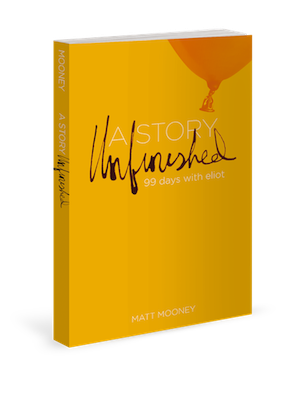 Within the pages of A Story Unfinished, Matt Mooney weaves together the surprising heights and heartbreaking depths of 99 days with his son, Eliot. In so doing, he challenges us all to see the beauty that God has crafted within the painful realities that we all will face. ~ Mark Merrill, president of Family First and author of All Pro Dad: Seven Essentials to Be a Hero to Your Kids.